Since many years now, we have occasionally sighted what looked like big cats prowling outside our home in the night. At one time we heard what sounded like a cat-fight on the roof, then suddenly a piece of the ceiling got dislodged what looked like a big cat almost fell down. It was able to hang on to the ceiling joists and scampered away. 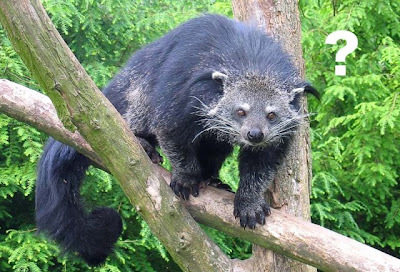 The animals are civets! 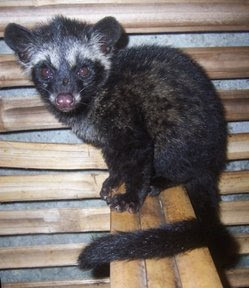 The fox-like civet, or “musang” in Malay, is quite common in rural kampongs. They are regarded as pests, preying on chickens. Over the years, as more and more rural folk moved to towns, so have the civets. Now they’ve come to Kuala Lumpur, and for a while, they made my attic their home! Civets, like humans are omnivorous. There are not many chickens in our neighbourhood, but lots of fruit trees. There are also the squirrel-like “tupai”. Perhaps food is easier to find here compared to the jungle or kampong! About a month ago we had another close encounter. We saw 4 or 5 pups wondering around in the front porch, then suddenly the mother climbed down a porch column and took hold of her pups and brought them away to a more secluded part of the garden. A couple of weeks ago we were able to see these nocturnal animals climbing down the mango tree and walking along the fence outside my bedroom window. Bananas left outside in the evening disappeared the next day. But we haven’t seen them since. This morning the squirrels (“tupai”) came back. Looks like for now it’s safe again for them. My post about the proliferation of the “tupai” in the city touched on the prospect of having pocket parks with trees that bear fruits and berries in front of every house opening up the possibility of introducing some species of wildlife to the neighbourhood. I wrote: “Get the food-chain set up, perhaps artificially augmented, then more animals can happily live (in the city)”. Is there also a place for the civet? Civets look like a mongoose on muscle program! I bet they could cause havoc in a house. The tupai looks like a nicer type to have hanging around the yard. I read the civet is on the endangered species. Is the tupai also?